Technology is not neutral—it wires our expectations. It enables our desires to be satisfied with ever increasing immediacy. The two-day delivery of Amazon Prime is not about to become passé. But like the other giant retailers Walmart and eBay, Amazon is in hot pursuit of the holy grail of Internet retailing—same-day service. And so is Google with Google Shopping Express, which was launched in March of this year. All talk of future delivery by drones aside, same-day services are already in place in several metropolitan areas that have the population density to support such a business model. For those of us small-town folks, a visit to the website of eBay Now will elicit an apology, “Sorry, we don’t deliver to Cookeville, TN yet.” Yet … we may someday! During the past few years, I have begun to feel that I need to take a more active role in shaping the temporal experiences of the students in my courses; that in the process of designing a syllabus I need not only to select readings, choose topics, and organize the sequence of material, but also to engineer, in a conscientious and explicit way, the pace and tempo of the learning experiences. When will students work quickly? When slowly? When will they be expected to offer spontaneous responses, and when will they be expected to spend time in deeper contemplation? I want to focus today on the slow end of this tempo spectrum, on creating opportunities for students to engage in deceleration, patience, and immersive attention. I would argue that these are the kind of practices that now most need to be actively engineered by faculty, because they simply are no longer available “in nature,” as it were. Every external pressure, social and technological, is pushing students in the other direction, toward immediacy, rapidity, and spontaneity—and against this other kind of opportunity. I want to give them the permission and the structures to slow down. In all of my art history courses, graduate and undergraduate, every student is expected to write an intensive research paper based on a single work of art of their own choosing. And the first thing I ask them to do in the research process is to spend a painfully long time looking at that object. 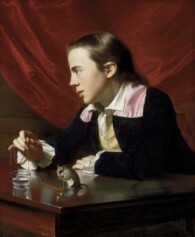 Say a student wanted to explore the work popularly known as Boy with a Squirrel, painted in Boston in 1765 by the young artist John Singleton Copley. Before doing any research in books or online, the student would first be expected to go to the Museum of Fine Arts, where it hangs, and spend three full hours looking at the painting, noting down his or her evolving observations as well as the questions and speculations that arise from those observations. The time span is explicitly designed to seem excessive. Also crucial to the exercise is the museum or archive setting, which removes the student from his or her everyday surroundings and distractions. At first many of the students resist being subjected to such a remedial exercise. How can there possibly be three hours’ worth of incident and information on this small surface? How can there possibly be three hours’ worth of things to see and think about in a single work of art? But after doing the assignment, students repeatedly tell me that they have been astonished by the potentials this process unlocked. What this exercise shows students is that just because you have looked at something doesn’t mean that you have seen it. Just because something is available instantly to vision does not mean that it is available instantly to consciousness. Or, in slightly more general terms: access is not synonymous with learning. What turns access into learning is time and strategic patience. “The Power of Patience,” by Jennifer L. Roberts was published in Harvard Magazine and can be found here. Dr. Roberts is currently Elizabeth Cary Agassiz professor of the humanities at Harvard University. She has accepted an invitation to occupy the Slade Professorship in Fine Arts at Cambridge University in 2018. “In War for Same-Day Delivery, Racing Madly to Go Last Mile” is available online. Go here to check out eBay Now. The Boston Globe article, “Instant gratification is making us perpetually impatient,” can be found here.